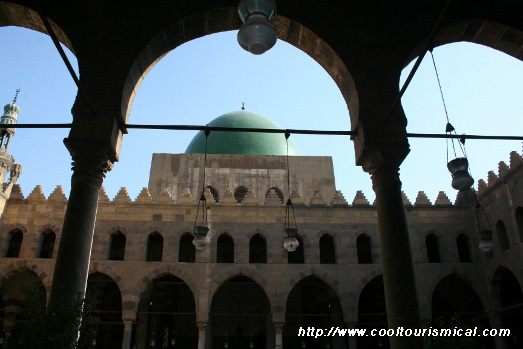 The mosque located in the Citadel in Cairo, Egypt was built in the 14th century (year 1318) by the Mamluk sultan Al-Nasr Muhammad as a royal mosque for the fortress. Sultan El-Nasir Mohammed was the son of Sultan Qala’un and the ruler of Egypt for about 42 years. 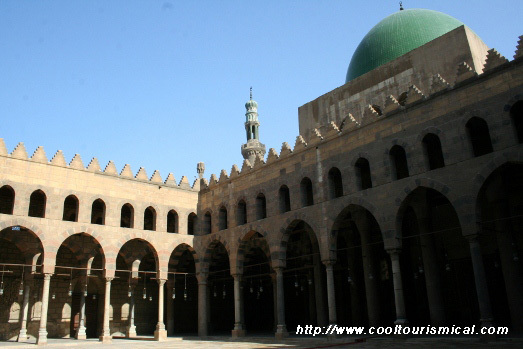 The mosque is admired for its large size since it has capacity for 5000 person and was one of the major congregational places in the region of the Citadel for a long time. The architecture is very interesting mixing materials from all the corners of the world due to its many restorations from 14th, 16th and 18th century. The present dome is modern, carried by granite columns taken from ancient Egyptian temples from Aswan. The ceilings covered by wood were made in India. 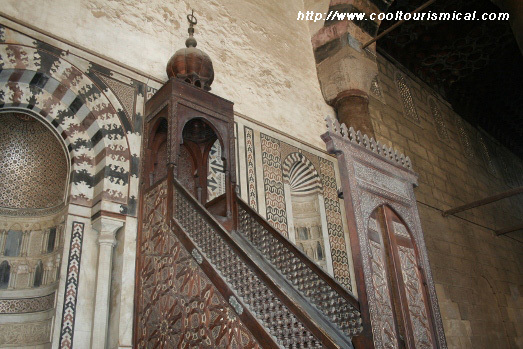 They used wood in the decoration of this mosque in order to prevent echoes when either the Imam was praying in Fridays or the Sultan gave his speech before wars. When the roof was rebuilt a dome of plastered wood covered with green tiles was added over the prayer niche. Sultan Al-Nasr Muhammad was a great constructor and he established many buildings, but most of them were destroyed at the time of Mohammed Ali. 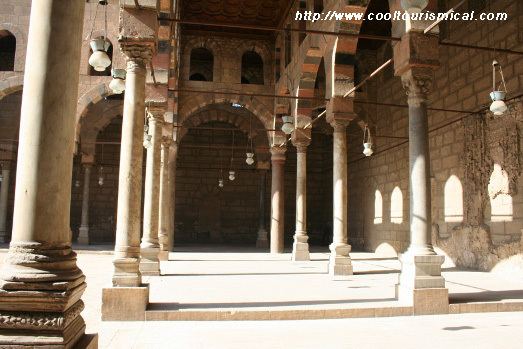 The name of the architect who built this mosque is El-Muallim Ibn El-Seyufi who is credited to the decoration of the Mosque of El-Maridani in 1340 as well. 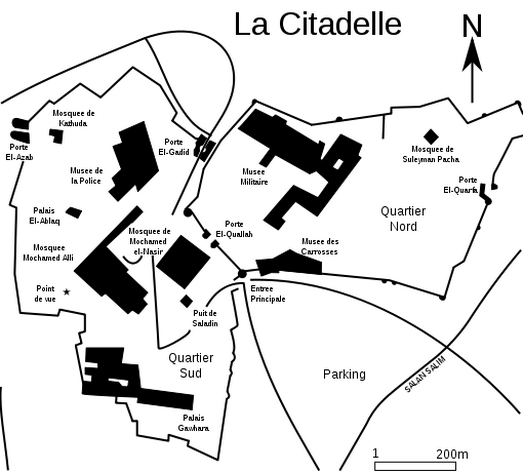 In the 1335 renovation, the mosque was heightened. 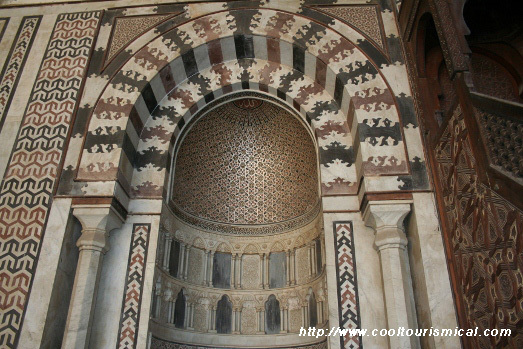 The interior façade as well as the upper structure is covered with green, white and blue glazed mosaics from Spain. And the columns that sustain the building come various periods and their capitols belong to Roman, Egyptian and Coptic cultures. For centuries the Qala’un Mosque was considered the most glamorous mosque in Cairo until the dome over the prayer niche collapsed in the sixteenth century and the high marble dado was carried off to Istanbul by the Ottoman conqueror Sultan Selim I. At the entrance many free books explaining Islamic religion await for the visitors. For me, it was a pleasant Arab civilisation experience and a voyage into Islamic cult.